This HomeReady™ loan information is accurate and current as of today, April 26, 2019. This post has been updated since its original publish date to reflect updates and clarification in the HomeReady™ program. The biggest challenge faced by new home buyers is overwhelmingly the down payment. You’re not alone if you’ve ever thought you could never save enough. HomeReady™ can help. It’s a 3% down loan geared to help lower-income home buyers who don’t have a lot to put down. That means it’s possible to get into a $200,000 home with just $6,000 down. At just three years old, HomeReady™ has already helped thousands become homeowners. Ready to be the next to buy a home with this program? HomeReady™ is a mortgage program created in December 2015. It’s backed by the U.S. government via Fannie Mae and available via most U.S. lenders. Via HomeReady™, households in lower-income neighborhoods and in minority-heavy areas can get easier access to low-downpayment mortgages at today’s current rates. HomeReady™ allows a downpayment of just 3% on a home and permits the “income pooling” for all of the members of a household. This means that income from grandparents, parents, relatives, and working children can all be used to help qualify for a home loan. For many families, this can mean the difference between getting approved for a loan and getting turned down. HomeReady™ can also be used for a refinance, allowing up to 97% loan-to-value (LTV) in some cases. If you can meet these two criteria, you may be HomeReady™-eligible. At least one borrower must obtain customized one-on-one homeownership counseling from a HUD-approved nonprofit counseling agency before entering into a home purchase contract. You have to show a Certificate of Pre-Purchase Housing Counseling (Form 1017) and the lender must input Special Feature Code 184 when it submits the loan to Fannie Mae. Approved counseling can also be used as a compensating factor for borrowers with debt-to-income ratios over 45 percent (possibly allowing up to 50 percent). Note: If at least one borrower completes the counseling and the lender inputs the special feature code, the lender gets a $500 rebate from Fannie Mae. Fannie Mae says that while it encourages lenders to pass on this credit to the borrower, the lender may choose to keep the rebate. So, once you have your Certificate of Pre-Purchase Housing Counseling Form 1017, ask lenders if they will pass on that $500 rebate to you when you shop for your HomeReady mortgage. Is HomeReady™ for first-time home buyers only? No, the HomeReady™ mortgage program can be used by first-time buyers and repeat buyers. 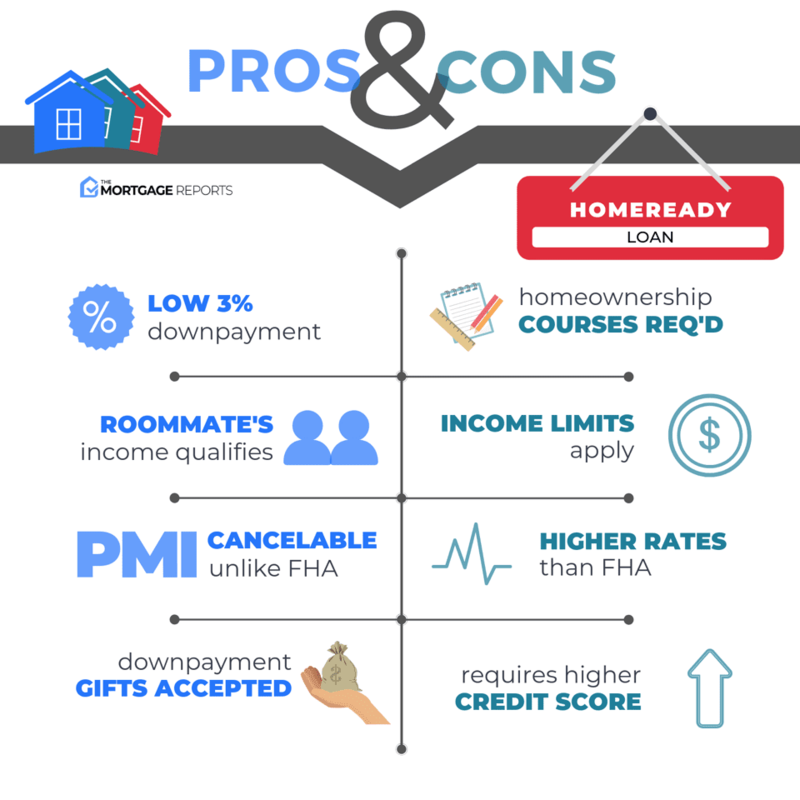 Is HomeReady™ the same thing as the MyCommunityMortgage? No. HomeReady™ is a new mortgage program as of December 2015. It’s not the same as a MyCommunityMortgage (MCM) and, in some respects, HomeReady™ can be viewed as a replacement. The MyCommunityMortgage program was retired by Fannie Mae in late-2015. Do I have to call Fannie Mae in order to apply for a HomeReady™ mortgage? No, you don’t have to call Fannie Mae to get a HomeReady™ home loan. Fannie Mae has authorized all of its approved mortgage lenders to issue HomeReady™ loans . You can get a HomeReady™ loan via any mortgage lender so pricing will be competitive. Be sure to get multiple quotes to make sure you’re getting the best price. My lender won’t do HomeReady™ loans. What do I do? Fannie Mae has given all of its approved mortgage lenders authority to underwrite and approve HomeReady™ mortgages. Your lender may be opting out, and that’s okay. There are plenty of approved mortgage lenders who can help you. Rates are available online. Do I need to have good credit to use the HomeReady™ program? No, you do not need to have good credit to use HomeReady™. You don’t even have to have average credit. The HomeReady™ mortgage program is available to homeowners whose mortgage credit score is at least 620. I don’t have a credit score. Can I still use the HomeReady™ program? Yes, you can still use the HomeReady™ if your credit score is non-existent. The program allows the use of non-traditional tradelines to establish credit history, including utility bills, gym membership, and most other accounts which require monthly payment. What are mortgage rates for the HomeReady™ loan? Mortgage rates for a HomeReady™ mortgage loan are the same as mortgage rates for a “traditional” loan. There is no premium applied for using the HomeReady™ program. In fact, current mortgage rates may even be lower for HomeReady™ mortgages as compared to a 3% down program such as the Conventional 97. Because mortgage rates can vary by as much as 50 basis points (0.50%) between lenders, though, it pays to shop around. Don’t stop shopping after you get your first quote. Can I use the HomeReady™ mortgage for a condominium? Yes, HomeReady™ home loans can be used for condominiums. Can I use the HomeReady™ mortgage for a co-op? Yes, HomeReady™ home loans can be used for co-ops. Can I use the HomeReady™ mortgage for manufactured housing? Yes, HomeReady™ home loans can be used for manufacturing housing. Can I use the HomeReady™ mortgage for a multi-unit home? Yes, HomeReady™ home loans can be used for 2-unit homes, 3-unit homes, and 4-unit homes. They cannot be used for a residential building zoned for 5 unit or more. Recent changes allow adjustable-rate mortgages and temporary buydowns for these properties as well. What is the HomeReady™ program’s minimum downpayment requirement? The HomeReady™ mortgage program is a low-downpayment loan requiring a minimum downpayment of three percent. Can my downpayment on a HomeReady™ home be a cash gift from a relative? Yes, your downpayment on a HomeReady™ loan can be a cash gift from a relative, a spouse, a girlfriend or boyfriend, or a fiancé/fiancée. The money does not need to be yours. What fixed-rate mortgage options do I have with the HomeReady™ program? Borrowers using the HomeReady™ mortgage program have access to a complete mix of fixed-rate mortgage products, including the 10-year fixed-rate mortgage; the 15-year fixed-rate mortgage; the 20-year fixed-rate mortgage; and, the 30-year fixed-rate mortgage. What adjustable-rate mortgage options do I have with the HomeReady™ program? Borrowers using the HomeReady™ mortgage program have access to a complete mix of adjustable-rate mortgage (ARM) products, including the 5-year ARM; the 7-year ARM; and, the 10-year ARM. Can I use the HomeReady™ mortgage if I own another home in the United States? No, the HomeReady™ mortgage program is for homeowners with interest in one home only. Can I use the HomeReady™ mortgage if I own another home outside of the United States? Yes, the HomeReady™ mortgage program does not restrict the number of properties you may own outside of the United States. Can I use the HomeReady™ mortgage if I own a timeshare in the United States or elsewhere? Yes, you can use HomeReady™ if you own a timeshare. For purposes of your loan approval, having a timeshare is not consider “ownership” of another home. Can I use the HomeReady™ mortgage if I own a piece of commercial property in the United States? Yes, you can own a commercial property in the United States and still get approved for the HomeReady™ residential mortgage loan program. Commercial property does not count against your “homes owned”. Can I use HomeReady™ to do a refinance? Yes, you can use HomeReady™ to do a home loan refinance. You may not use the program to do a cash-out refinance, though — only rate-and-term refinances are allowed. My parents live with me. Can I use their income to help qualify for a mortgage? Yes, this is the purpose of the HomeReady™ mortgage program. You are allowed to use the income of a person living in your home to help you qualify for your home loan. My children live with me. Can I use their income to help qualify for a mortgage? Yes, this is why the HomeReady™ mortgage program was created. The income of a person living in your home can be used to help you qualify. Can I use income from someone whom is not my parent or child with the HomeReady™ program? Yes, via the HomeReady™ mortgage program, you can use the income of anybody living in your home to help get mortgage-qualified. This can be your aunt, your uncle, a brother or sister, a friend, or anyone else. If I use the income of somebody living in my house to help qualify for the HomeReady™ loan, does that person need to be on the mortgage application? No, you do not need to include other people on your HomeReady™ mortgage application — even if their income is used to help you qualify. In order to use another person’s income on your application, you will only need to show that person’s proof of income and a signed statement indicating their intent to live with you for a period of at least 12 months. Do I have to show a history of co-habitation in order to use a relative’s income for my mortgage approval? No, prior co-habitation is not required in order to use a relative’s income on your HomeReady™ mortgage application. You’re only required to show a signed statement which indicate your co-habitant’s intent to live in your home for a period at least 12 months. Is there a maximum allowable number of co-habitants with the HomeReady™? No, the HomeReady™ program does not limit the number of relatives living in one home, nor the number of relatives whose income is used to help qualify for the program. For the HomeReady™ mortgage program, do my co-habitants have to be legal residents of the United States? No, via the HomeReady™ home loan program, non-borrowing relatives do not need to be legal residents of the United States of America. Is it true that HomeReady™ mortgage rates are lower than “regular” mortgage rates? Yes, mortgage rates will be lower with the HomeReady™ mortgage program as compared to other conventional mortgage loans — especially when the borrower puts down less than 20%. How much of my own money do I need to bring to closing with the HomeReady™ program? You are not required to bring any of your own money to closing with the HomeReady™ mortgage program. Your downpayment can be gifted to you from a third-party, and you can have the home seller pay for your closing costs using an option known as seller concessions. Is there a maximum debt-to-income ratio with the HomeReady™ mortgage? Yes, the HomeReady™ program limits borrowers to a 50% debt-to-income ratio. Does the HomeReady™ mortgage loan require private mortgage insurance (PMI)? Yes, the HomeReady™ program requires borrowers to pay private mortgage insurance (PMI) when they borrow more than 80% of the home’s value. Is it true that private mortgage insurance (PMI) costs for the HomeReady™ program are lower than with other conventional loans? Yes, the HomeReady™ program features lower mortgage insurance costs than other conventional loans, including the other three percent down program, the Conventional 97. How long must I pay private mortgage insurance under the HomeReady™ program? HomeReady™ is a conventional mortgage loan via Fannie Mae, which means that you are required to pay private mortgage insurance until your home’s loan-to-value (LTV) reaches 80% of the original purchase price, or 80% of the home’s market value. HomeReady™ loans are available in low-income census tracts. What is a “low income census tract”? A low-income census tract is an area in which the median household income is at least 20% below the average median household income for an area. Homes in these low-income census tracts are eligible for HomeReady™ regardless of their annual household income. HomeReady™ loans are available in high-minority census tracts. What is a “high-minority census tract”? A high-minority census tract is an area in which the minority population is at least 30%, and in which the median household income is less than the median household income for the area. Can I use the HomeReady™ loans if I don’t live in a low-income census tract or a high-minority census track? Yes, you can use the HomeReady™ program even if you don’t live in a low-income census tract or a high-minority census tract. So long as your household income is not above the area median income, you can get approved. My household is not considered low-income. Can I still use HomeReady™? Yes, you can use HomeReady™ if your household is not considered “low-income” so long as you’re buying a home in a low-income census tract. There are no maximum or minimum income restrictions for borrowers with homes in low-income census tracts. I earn a large income, but I live in a low-income census tract. Can I use HomeReady™? Yes, regardless of your income, if your home is in a low-income census tract, you can use the HomeReady™ mortgage program. Can I still use HomeReady™ if I am not considered “a minority”? Yes, you do not need to be considered a minority to use the HomeReady™ mortgage loan. HomeReady™ is available to everyone who qualifies. What is Fannie Mae’s definition of “designated disaster area”? A designated disaster area in one which has been affected by storm or other force, and which has been so categorized by the Federal Emergency Management Agency (FEMA). Recent disaster declarations include parts of Texas (storms), Washington (flooding and mudslides), and California (wildfires). So, if I live in a designated disaster area, I might be HomeReady™ eligible? Yes, homes in disaster areas are eligible for HomeReady™ financing for households in which income does not exceed the average median income for the area. The area does not need to be a low-income area or a high-minority area to qualify id it’s in a FEMA-declared disaster area. What’s the smallest downpayment allowed with HomeReady™? The HomeReady™ program requires a minimum downpayment of 3% of the purchase price, of $3,000 per $100,000. Can I use boarder income to help get approved for HomeReady™? Yes, the HomeReady™ program allows a borrower to use boarder income to help get qualified. Boarders must have a 12-month history of living with you and contributing income. Documentation of all twelve months is not required. Do I have to take homeowner counseling courses as part of the HomeReady™ mortgage program? Yes, homeowner counseling is required with the HomeReady™ program. Classes are provided online and can be completed in 4-6 hours. I’ve taken homeowner counseling courses previously. Can I apply my completion certificate toward HomeReady™? Yes, you can use the certificate from your previous homeowner counseling course as part of your HomeReady™ mortgage application, so long as the course was completed within the last six months. Note that beginning October 1, 2016, prior certificates must be renewed. Can I claim income from an accessory unit, such as basement apartment, on my HomeReady™ mortgage application? Yes, HomeReady™ allows rental income from accessory units to be claimed on a mortgage application. My house is not zoned for an accessory unit, such as a basement apartment, but I collect rent on it anyway. Can I use this income on my HomeReady™ mortgage application? Yes, via HomeReady™, you can claim income from an accessory unit even if your home is not zoned for rental income. I am collecting rental income from a unit which does not comply with local zoning requirement? Can I use the income on my HomeReady™ mortgage application. Yes, if your one-unit home does not comply with local zoning requirements and you’re collecting rental income from an accessory unit, you can still use the income on your HomeReady™ mortgage application. I don’t have a bank account. Can I use cash-on-hand for a downpayment on a home? Yes, you can use cash-on-hand for a downpayment. You do not need to have “money in the bank”. Can I use the HomeReady™ program for a community land trust? Yes, you can finance a community land trust home via the HomeReady™ mortgage program. What Are Today’s HomeReady™ Mortgage Rates? The HomeReady™ mortgage program is designed to help more U.S. households get approved for low-downpayment loans. Borrowers can use income from relatives and non-relatives for purchase and refinance home loans.